Radio420™: The KillJoy Club confirmed for Gathering of the Juggalos 2018! The KillJoy Club confirmed for Gathering of the Juggalos 2018! Yes! You read the headline correct! 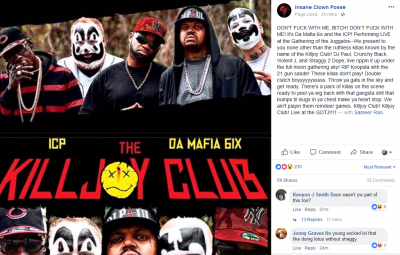 Insane Clown Posse and Psychopathic Records has announced across social media that the ICP and Da Mafia 6ix supergroup “The KillJoy Club” will be performing at this years Gathering of the Juggalos in Thornville, Ohio inside Legend Valley! This is beyond exciting, ninjas! No one expected this! This years Gathering *Whoopstock* will begin on Wednesday, July 18th and final showtime is Saturday, July 21! Still time to pick up your tickets at https://tickets.juggalogathering.com/ .Whoop! Whoop!